Lent is a season of penance and ascetical warfare. The enemy is concupiscence, the world, and the devil. The goal is pure hearts so that we can joyfully celebrate the resurrection of our Lord at Easter, the greatest feast of the liturgical year. In a way, Lent should be a microcosm of our entire struggle on earth, just as the Paschal feast of Easter is a microcosm of our heavenly triumph in Christ. Yet, a good Lent takes focus and discipline, and it can easily be wasted. In my own experience, I often begin the lenten season with the best of intentions. I imagine myself going into full monk mode, fasting and praying as ardently as one of the monastic fathers in the desert. And maybe for the first week I succeed through sheer strength of will. Then, just when I am feeling good about myself, everything falls apart and I come face to face with my own weakness. We’ve all been there at some point, and so today I’d like to share 7 practical ways to have a good Lent. 1. Have a plan – The fastest way to ruin Lent is to have good intentions but no plan. Be specific. “I’m going to pray more,” isn’t good enough. Download this helpful worksheet to get started. Once you’ve determined what you are going to do, stick to it every single day. One word of advice: Make it doable. Often, we are overly ambitious and commit to way too much. When we fail in our lenten goals, we grow discouraged and give up completely. This is a victory for the devil. Make your commitments modest and practical, and your Lent will be the better for it. 3. 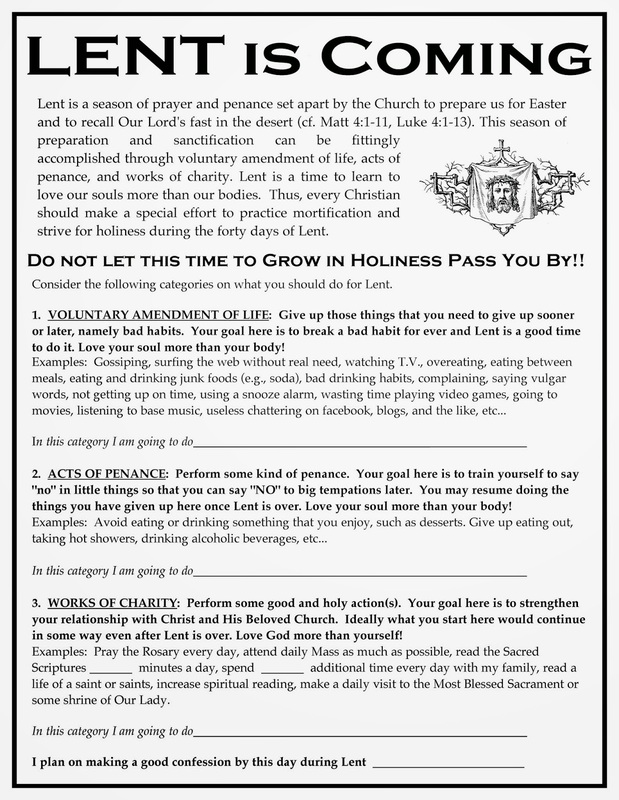 Examine yourself – Lent is an excellent time to take an inventory of the state of your soul. What are your predominant faults? Do you have any hidden idols in your life? What is keeping you from following the will of God with all your heart? Use a thorough examination of conscience to help you assess your spiritual health. Remember, Lent is not ultimately about giving up sweets or other things we enjoy, it is first and foremost about repentance, which means giving up up sin and returning to God, our loving Father. While taking inventory of your sins may be painful, it is a healthy pain that restores the soul. 4. Confess your sins – After examining your conscience, the logical next step is to go to confession. Normally, it can be hard to find a parish with confession readily available (thirty minutes on a Saturday isn’t enough! ), but the good news is, many parishes have increased confession times during Lent, so it’s a great time to go. 5. Pray – Let’s face it, we can all pray more, and Lent is a great time to plan and implement a daily prayer rule that can guide you the rest of the year. During this season, however, we should especially focus our prayers on repentance and contrition for our sins. Here are some suggestions for Lenten prayer. 6. Fast – I’ve written before about the importance of prayer and fasting, so suffice it to say that it is something we should be doing all year round, not just during Lent. Still, Lent is a very good time to refocus our efforts and renew our commitment. We should especially focus on fasting from things related to our predominant sins. Are you addicted to Instagram or Facebook? Fast from them. Maybe you’re binge watching shows on Netflix. Give it up. On the other hand, maybe you’re addicted to criticizing others. Make a special effort to fast from negative speech. The point is, while fasting from certain foods is an excellent ascetical practice, we do not have to limit our lenten fasting to things we eat. Remember the words of Jesus: “If your eye offends you, pluck it out.” Nothing should stand between us and the heavenly kingdom, and we should be intentional about cutting off those things that are causing us to sin. 7. Give alms – During Lent, we especially remember the sacrifice of our Lord Jesus Christ on the cross. This is the greatest act of generosity in history, for Jesus died not just for his friends, but for his enemies. “God shows his love for us in that while we were yet sinners Christ died for us” (Romans 5:8). I began this post by talking about my own failure, and yet, when it comes to lenten disciplines, true failure is not really possible. I mean that even failing in our commitments can help us grow in humility and knowledge of our own spiritual poverty—and growth in these is always spiritual advancement. This Lent, do your best. Strive to root out sin and cultivate holiness. But when you fail, realize that even those who can be considered righteous fall seven times daily (Prov. 24:16). Let your failure be a lesson in humility that drives you back to the grace of God flowing from the pierced heart of Jesus—for that is the true heart of Lent. Good read! Here’s a novel idea for Lent: find a Tridentine Mass site and you can attend confession 30 minutes prior to Mass starting ( pretty much a standard practice prior for any Traditional Mass)…give up the New Mass for Lent and attend a TRUE Latin Mass instead…, your soul will thank you! For fasting we are trying the Lenten Mercy Challenge. On Fridays in Lent you fast on bread and water for lunch and pray one decade of the Rosary and offer those actions as an act of Mercy for a special intention of your choosing. Go to LentenMercyChallenge.org for details. Very interesting. I am not Catholic, but I do enjoy your blog immensely. this is very helpful. thank you! 🙂 will share it also with my friends. Hi ! Thanks for the reminder …Don’t Waste …. have been wasting God’s time on me ! Out standing Catholic .. This will be my first year seriously doing Lent .. Thanks for the article Mr. Guzman. This would be my second Lent as a convert. The first one i mess up big time for the lack of musclular stamina, so to speak. This year i’m more confident because i know where to get my strenght. Temperance, penance and prayer have been on my schedule more and more lately. Besides, what’s up with this Matthew Kelly’s Lent? Really THIS is the time to mortify the flesh! Do so even for those who do not. Forget chocolat, give even yourself up. Thank you for you’re great article. Another option to not wasting your lent! Have the best one ever! We are signed up for this at my Newman Center. It has gotten me excited for lent to start and for us to grow stronger in Christ. What a wonderful reminder of simple and concrete ways for us to keep Lent. Thank you! I find it a shame that we are not able to “pin” this article on Pinterest. Is that an option you may provide for us in the future? Nothing reminds one of Jesus’ humanity like attributing the common grammatical mistake “you’re” vs. “your” to Him. I think you neglected to link to the helpful worksheet you mentioned. Love of Eternal Wisdom is a perfect book for Lent although I had to read it twice to really understand it. Nice work Sam!